Journal of Nanjing Agricultural University, 2019, 42(2): 345-351. 安世钰, 张国敏, 尤佩华, 等. PPARGC1A/NRF1/TFAM通路核心基因在湖羊睾丸发育过程中的表达变化[J]. 南京农业大学学报, 2019, 42(2): 345-351. Abstract: [Objectives] The objective of this study was to elucidate the localization and expression of the key PPARGC1A/NRF1/TFAM pathway genes in the testis of prepubertal(3-month-old) and postpubertal(9-month-old) Hu sheep. [Methods] Eighteen male Hu sheeps with good body conditions and clear pedigree were selected for this experiment(3-and 9-month-old, n=9). The testis was collected after blood collection. The concentrations of testosterone(T), leptin, insulin and insulin-like growth factorⅠ(IGF-Ⅰ) in the blood samples was detected by ELISA; cellular localization of PPARGC1A/NEF1/TFAM pathway key proteins in testis was detected by immunohistochemistry; and the expression patterns of the PPARGC1A/NRF1/TFAM pathway core genes in testis tissue were detected by RT-qPCR and Western blot. [Results] Compared with the 3-month-old Hu sheep, the concentrations of the T, leptin, insulin, and IGF-Ⅰ in the peripheral blood of 9-month-old Hu sheep significantly increased(P < 0.05, respectively). 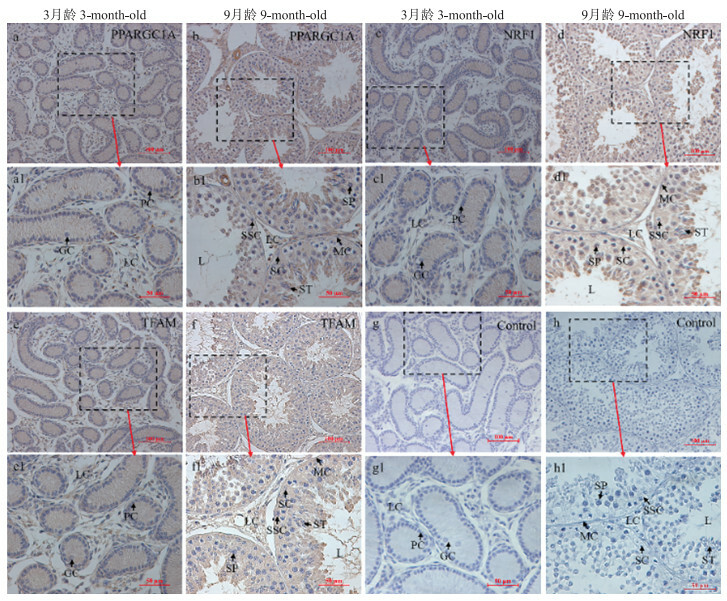 Immunohistochemistry results showed an age-related and tissue-specific expressions of PPARGC1A/RNF1/TFAM pathway key proteins in the testis of 3-month-old and 9-month-old Hu sheep. In addition, the mRNA of PPARGC1A, NRF1 and TFAM and its protein expressions in the testis of 9-month-old Hu sheep were significantly higher than those in 3-month-old Hu sheep(P < 0.05). [Conclusions] The PPARGC1A/RNF1/TFAM pathway may be closely associated with testicular development and sexual maturation of Hu sheep. 注: PPARGC1A :过氧化物酶体增殖物激活受体γ辅助激活因子1α基因Peroxisome proliferator-activated receptor gamma coactivator 1-alpha gene; NRF1 :核呼吸因子1基因Nuclear respiratory factor 1 gene; TFAM:线粒体转录因子A基因Mitochondrial transcription factor A gene; GAPDH:甘油醛-3-磷酸脱氢酶基因Glyceraldehyde-3-phosphate dehydrogenase gene. 图 1 3月龄和9月龄湖羊血液中睾酮(T)、瘦素、胰岛素及IGF-Ⅰ的浓度变化 Fig. 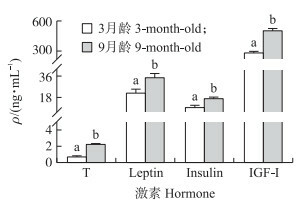 1 Testosterone(T), leptin, insulin and IGF-Ⅰ concentrations in the peripheral blood between 3-month-old and 9-month-old Hu sheep 同一指标中, 不同字母代表组间差异显著(P < 0.05)。下同。 In the same indicator, values with different superscript are significantly different(P < 0.05).The same as follows. 图 2 PPARGC1A/NRF1/TFAM通路相关蛋白在3月龄和9月龄湖羊睾丸组织中的表达定位 Fig. 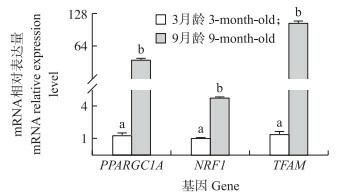 2 Localization of PPARGC1A/NRF1/TFAM pathway key proteins in testis of 3-month-old and 9-month-old Hu sheep a—f分别为PPARGC1A、NRF1和TFAM蛋白在性成熟前后湖羊睾丸组织中的细胞定位; a1—f1为相应部位的放大图; g、g1、h、h1为阴性对照。GC:性原细胞; PC:前精原细胞; MC:肌样细胞; ST:精子细胞; SP:精母细胞; SSC:精原干细胞; LC:间质细胞; SC:支持细胞。 a-f are the cellular localization of PPARGC1A, NRF1 and TFAM proteins in the testis tissue of prepubertal and postpubertal Hu sheep; a1-f1 are magnified views of corresponding parts; g, g1, h, h1 are negative control. GC:Gonocytes cells; PC:Prospermatogonia cells; MC:Myoid cells; ST:Spermatozoa; SP:Spermatocytes; SSC:Spermatogonia stem cells; LC:Leydig cells; SC:Sertoli cells. 张阳海, 李永, 曹迪, 等. 睾酮对动物生殖和生长发育影响的研究进展[J]. 家畜生态学报, 2018, 39(1): 1-7. 郑九嘉, 楼哲丰, 郑蔚虹, 等. 线粒体呼吸功能与精子活力、核DNA损伤的相关性分析[J]. 中国细胞生物学学报, 2012, 34(1): 34-40. Zheng J J, Lou Z F, Zheng W H, et al. Analysis of mitochondria respiratory function associated with motility of sperm and nucleus DNA damage[J]. Chinese Journal of Cell Biology, 2012, 34(1): 34-40 (in Chinese with English abstract). 岳根华, 谢成侠, 程瑞禾, 等. 湖羊及考力代公羔生殖系统发育与精子发生的研究[J]. 南京农业大学学报, 1993, 16(3): 69-73. Kim J H, Park S J, Kim T S, et al. Testosterone production by a Leydig tumor cell line is suppressed by hyperthermia-induced endoplasmic reticulum stress in mice[J]. Life Sciences, 2015, 146: 184-191. Nobue K, Wanzhu J, Gen W, et al. Age-related changes of reproductive hormones in young Meishan boars[J]. Journal of Reproduction & Development, 2006, 52(5): 651. Cui Y Q.Effects and mechanisms of testosterone on insulin secretion and cell apoptosis in β cells[D].Jinan: Shandong University, 2012(in Chinese with English abstract). 林晖榕, 陈慎仁, 傅玉才, 等. 不同月龄大鼠胰岛细胞衰老及胰岛素表达的研究[J]. 中国病理生理杂志, 2009, 25(1): 180-182. 李松, 李建波, 李金凤. 1岁以内不同胎龄儿生长速度的比较及与FGF21、瘦素的相关性[J]. 中国妇幼保健, 2017, 32(2): 308-310. Li S, Li J B, Li J F. Comparison of growth velocity of infants of different gestational age under one year and the correlation with FGF21 and leptin[J]. Maternal and Child Health Care of China, 2017, 32(2): 308-310 (in Chinese with English abstract). Spicer L J. Leptin:a possible metabolic signal affecting reproduction[J]. Domestic Animal Endocrinology, 2015, 21(4): 251-270. Guerriero G, Trocchia S, Abdel-Gawad F K, et al. Roles of reactive oxygen species in the spermatogenesis regulation[J]. Front Endocrinol(Lausanne), 2014, 5: 56-61. Yu Y X, Han Y L, Niu R Y, et al. Ameliorative effect of VE, IGF-Ⅰ, and hCG on the fluoride-induced testosterone release suppression in mice Leydig cells[J]. Biological Trace Element Research, 2018, 181(1): 95-103. Martinezabundis E, Rajapurohitam V, Gertler A, et al. Identification of functional leptin receptors expressed in ventricular mitochondria[J]. Mol Cell Biochem, 2015, 408(1/2): 155-162.